CONTEMPORARY DANCE. The Best Resources and Information Online. What is contemporary dance today? Are you a contemporary dance student, dancer, choreographer, teacher, researcher, producer, lover, curious…? Do you want to know, understand or find out something about this art? Is there any related topic you’d like to discuss? WELCOME DEAR COLLEAGUE ! THIS IS OUR WEBSITE ! •	A great blog full of updates, posts and shared content from dancers around the world. •	A lot of useful information about the different movement techniques used in our body-mind training (Flying low, Release, Feldenkrais, Contact Improvisation, Hatha Yoga, Ballet, Graham and more… !). •	Fantastic tools for creating choreography. •	Theory (such as definitions, dance notation, articles or reviews). 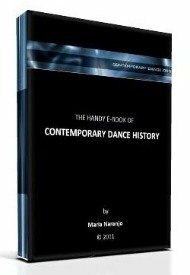 •	Dance teaching advices, ideas and tips. •	Contact data about dance companies, festivals, schools, scholarships, related websites… all in our dance directory (ordered by countries). •	Current announcements like auditions, performances, workshops, meetings and other news. •	A gallery of dance pictures, dance videos, dance poetry and dance jokes where you can broadcast and share. •	Important and specific information about health for dancers, like our diet or common injuries. •	A section for asking questions about dance that works like a world wide forum where our sister/brotherhood can meet and have constructive discussions about our common interests. •	The Dance Thinker: A free e-zine to which you can subscribe (the form is located in the right column), to receive interesting articles and news. •	A great place to advertise your dance related products or services, like dance wear, dance floors, classes and so on. •	Unexpected things ; )… just navigate around and you'll see! My goal has always been to gather the tools, information and experience that would allow me to make a living out of dancing. Dance is my passion, dance is my life, dance is my enormous little secret (… bet you know what I mean!). After all this years of research and work, I’m glad to share my understanding and professional experience with you. Please, make yourself at home… you are at contemporary-dance.org!